The Freightliner Argosy received a major upgrade in 2011 and features a new exterior style and a host of technical modifications. 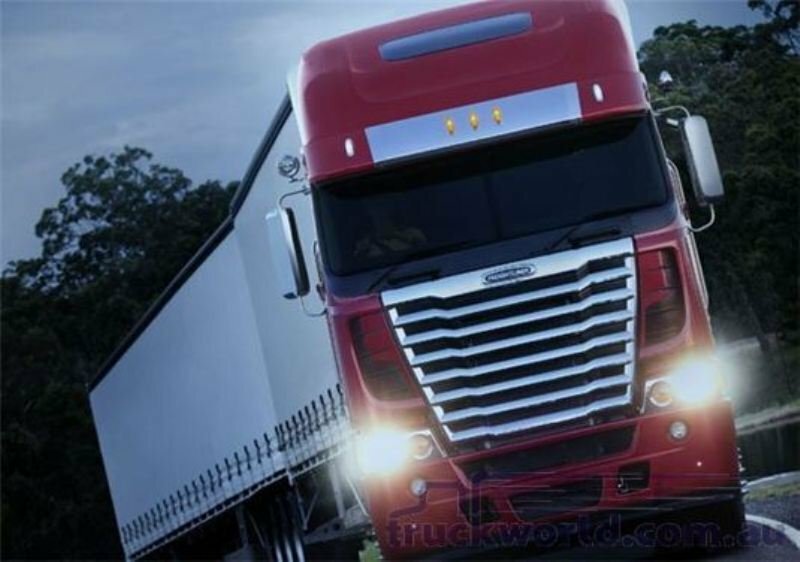 A few years ago, Freightliner decided to withdraw the truck from the US market, and focus especially on the Australian and South African markets. Compared to the old generation the latest model is a major evolution, as besides the exterior and interior upgrades it also comes with a wider range of engines and transmissions which make it more versatile. Moreover, the truck is also fitted with a improved air management system along with a much larger radiator. There are two engine options available for the Freightliner Argosy, namely the Detroit Diesel DD15 and Cummins ISX. The engines offer maximum outputs that can go up to 600 hp with 2050 lb-ft of torque. Available in 90”, 101”, 110” midroof and 110” raised roof variants, the Argosy’s cabins offer a high level of versatility and are designed to cope with a wide range of road missions. The new generation Freightliner Argosy is also available in 6x4 and 8x4 versions and can be rated up to 140 tonnes GCM (gross combination mass). Thanks to its cab over engine configuration the truck features a pretty tall height and an imposing stance. It features a massive “V” shaped grille which features a bunch of tasty chromed horizontal stripes. The grille looks great as its imposing design demands respect and is an instantly eye catcher. 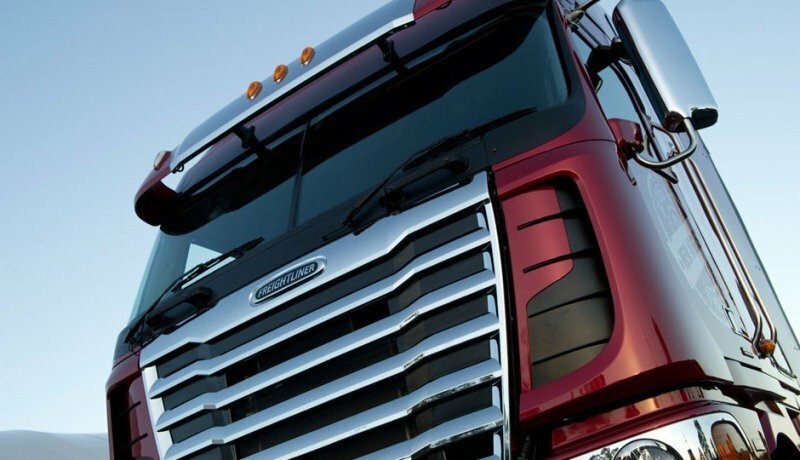 The grille is flanked by two huge side deflectors which feature a fluid design and enhance the truck’s aerodynamics. We also like the twin headlights which come with a chromed case that looks great next to the shiny grille giving the truck a sense of unity. The bumper features a nice curved design to further improve the truck’s aerodynamics and is fitted with two round fog lights to improve the road visibility. Other elements that keep the drag coefficient to a low level are the door mirrors and the raked windshield which reminds us about Volvo’s FH model. Access inside is made pretty easy, as the steps and handles are placed ergonomically serving you well all the way up. The interior is fairly spacious and features a completely flat floor allowing you to move free through the cabin. The materials aren’t part of the premium league and can’t be compared with what you’ll get from the Volvo FH or Mercedes Actros, but they are solid and look lasting. Compared to the previous generation, the new dashboard is made with an injection moulded material, as opposed to the previous vacuum formed components. The fit and finish is pretty good too, and you won’t have any major complain in this department either. The doors feature a new design with larger windows to improve the visibility and double seals for extra solidity and an improved sound isolation. We’re not big fans of the fake wood trim that covers the dash, but we’ll have to admit that we like how it looks on the two spoke steering wheel, as it gives it a touch of class. For maximum convenience, the steering wheel can be adjusted for both reach and rake, allowing you to find a proper driving position pretty fast. 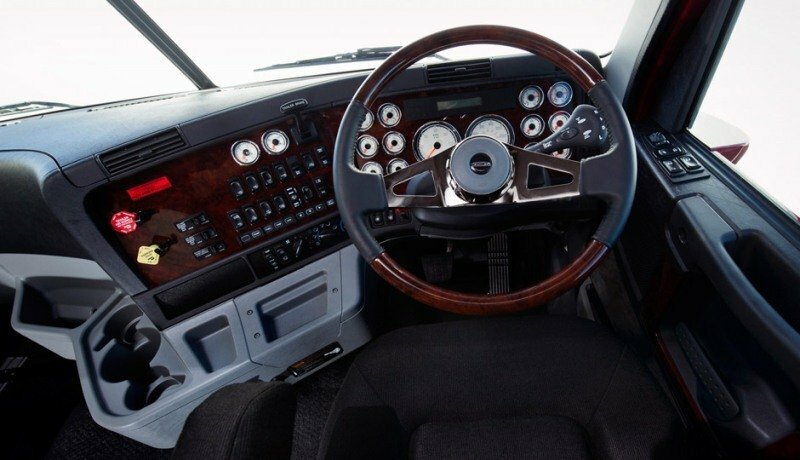 Freightliner never had major problems when it comes to ergonomy and the Argosy makes no exception, as everything is within easy reach, while the seats are also fairly comfortable. Furthermore, the big captain chairs come with folding armrest and with a wide range of adjustments which make you feel like home. Outward visibility is good too, and you won’t find any large blind spots on either side that won’t be solved with a simple mirror adjustment. Drivers will be happy to hear that every Freightliner Argosy comes with electric windows, air suspended seats and cruise control. There are clever storage compartments wherever you look, and external locker boxes can be accessed from inside the cabin, while the sleeper cab ads a 51” wide bunk which is fairly comfortable. Freightliner also offers an additional upper bunk which is available for the high roof model. Compared to the previous model, the NVH levels are also significantly lower as in the new cab you can talk without restriction while cruising with over 100 kmph. Start the engine and you’ll instantly recognize the typical roar of the Detroit DD15. Compared to the previous unit (the Series 60) the new engine is slightly more refined and responsive without losing its magnificent growl. The new cooling system is also very capable and is able to keep the engine to a proper temperature without too many struggles. This performance was achieved by adjusting the cabin height and designing a new front firewall to optimise air flow past the engine bay. The DD15 unit also features a powerful integrated engine brake, an Exhaust Gas Recirculation (EGR) system and BlueTec emissions technology. The engine was especially designed for long haul operations and develops between 455-560 hp with maximum torque figures between 1550-1850 lb-ft. The Freightliner Argosy is also offered with a choice of Cummins ISX engines. The Cummins ISX features an advanced fuel injection technology, improved cooled EGR subsystem and a VGT Turbocharger. The unit uses Selective Catalytic Reduction (SCR) technology for enhanced fuel economy and lower emissions. The Cummins ISX power ratings range from 400-600 hp with a maximum 2050 lb-ft of peak torque. To keep all that power under control, Freightliner uses Eaton‘s new UltraShift automated transmission with Electric Clutch Actuation and intelligent shift selection software which helps perfect launch and shift decisions. A Hill Start Aid is also available to prevent rollbacks. The Freightliner Argosy is offered with a wide range of front parabolic taper leaf springs with a capacity of up to 7,258 kg, while at the back it is available with a choice of either steel or air suspensions with maximum GCMs of up to 140 tonnes. The cab’s suspension works pretty effectively and won’t make you feel uncomfortable even on the difficult roads. At high speeds there also only a minor rocking motion which won’t affect you too much. Besides the engine brake, the stopping power is assured by all round disc brakes combined with ABS and traction control. With the new Argosy it seems like Freightliner has a winner in its hands as the truck has anything it needs to take a healthy share from the heavy duty truck market. Its engines have already proven their value in other models built by the company and are seen with good eyes in the trucking industry, being appreciated for their strong performances and efficiency. The new design looks great too and is able to make a few jaws drop when passing along the street. We also like the overall built quality which is much improved compared to the previous generation. Inside not much is changed, but a closer inspection will reveal a few key upgrades which improve the comfort and make the interior look slightly more upscale.